I’ve spoken before but how much of a game-changer mega-evolutions were to Pokémon. Now, I’m going to speak about it some more and don’t bother trying to escape, I locked the door and laced the biscuits with paralysing chemicals. Now then, mega-evolutions aren’t just cosmetic changes to your Pokémon. They’re stat-boosting transformations that can give you the edge in battle. And of course, another starter Pokémon is getting one. 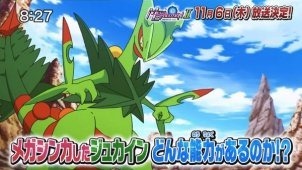 And that starter is none other than Sceptile. Which makes perfect sense really. In Pokémon X and Y, each of the three original starter Pokémon had a mega evolution, with Charizard having access to not one but two such boosts. If you got the game early enough, there was also a chance to download a Torchic that came equipped with the stone necessary to mega-evolve into such an advanced creature, once it evolved into its final form, Blaziken. 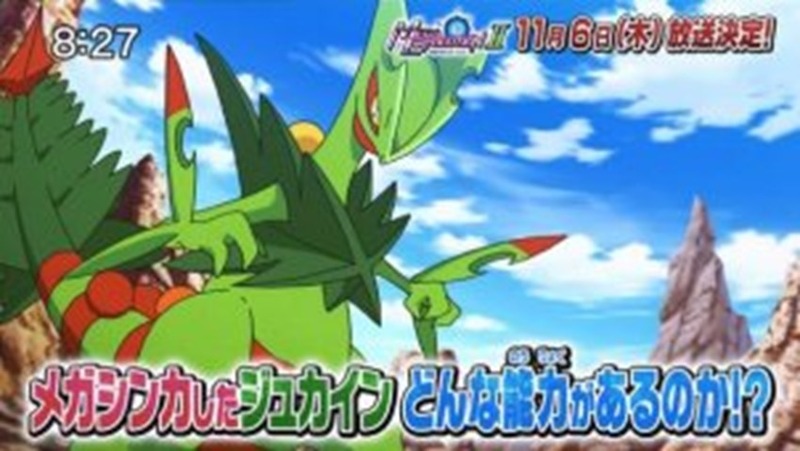 Sceptile is next, and will be making it’s mega-evolved debut in “Pokémon Mega Evolution ~Act 2~” according to Serebii, on November 6. This follows the first such anime special, which focused on a Pokémon trainer named Alan who roamed the countryside catching the pocket monsters, battling them and steering clear of the PETA loonies who threatened to burn his house down. Sceptile isn’t the only Pokemon getting a Darwinian upgrade however. Swampert also evolves further, joining the likes of Slowbro, Audino,Lopunny,Altaria,Salamence, Sableye and Diancie who are all going mega. Pokémon Alpha Sapphire and Omega Ruby is out soon. Very soon in fact, on November 28 for us European territories.